'Scenes of Aboriginal life' (detail), ca. 1880s, pencil, coloured pencil and watercolour drawing, 55.1 x 74.2 cm. Image courtesy the State Library of NSW. 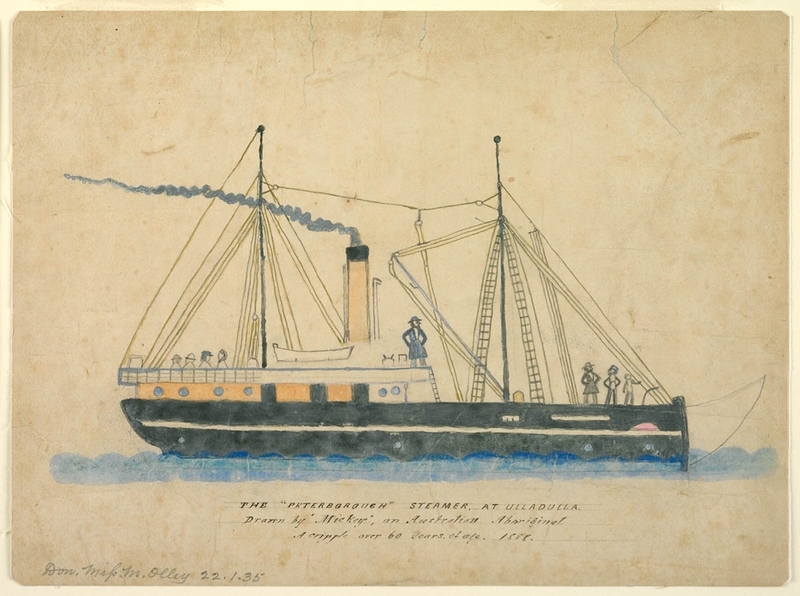 'The "Peterborough" steamer, at Ulladulla' (detail), 1888. Image courtesy the State Library of NSW. 'Ceremony' (detail), pencil & coloured pencil drawing ; 32 x 39.8 cm. Image courtesy the State Library of NSW. ­­Mickey of Ulladulla, along with William Barak, Oscar from Cooktown and Tommy McRae, are artists who were wedged between their traditional Aboriginal lifestyle and one radically changed by colonial expansion in full swing during the late 1800s. 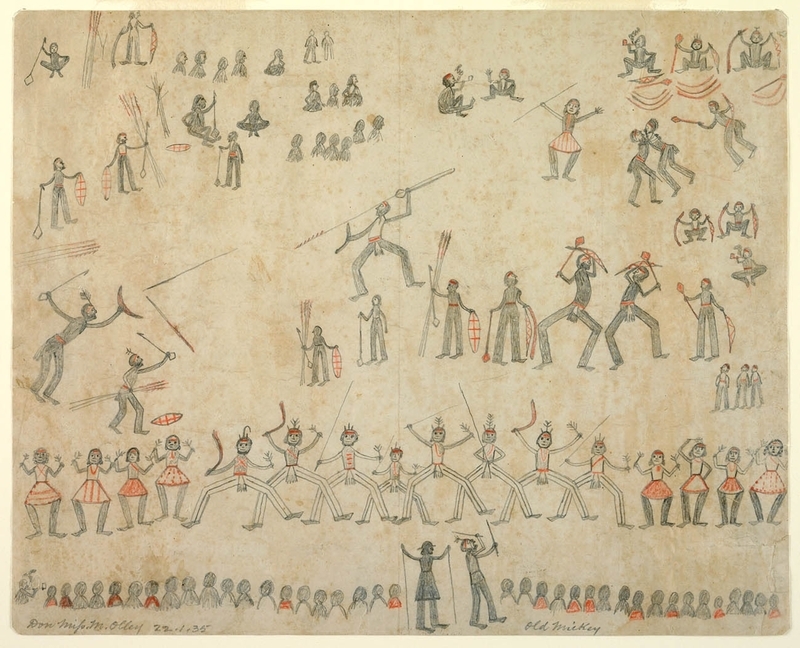 These men and their art, describes a time after their tribal lands had been broken up and given to sheep; when their families and extended families had been clustered together on the remnants of what remained; when Christian missions and the Aborigines Protection Board had begun to actively intervene in the lives of Indigenous people; and when many Aboriginal people lived in resultant poverty and destitution. 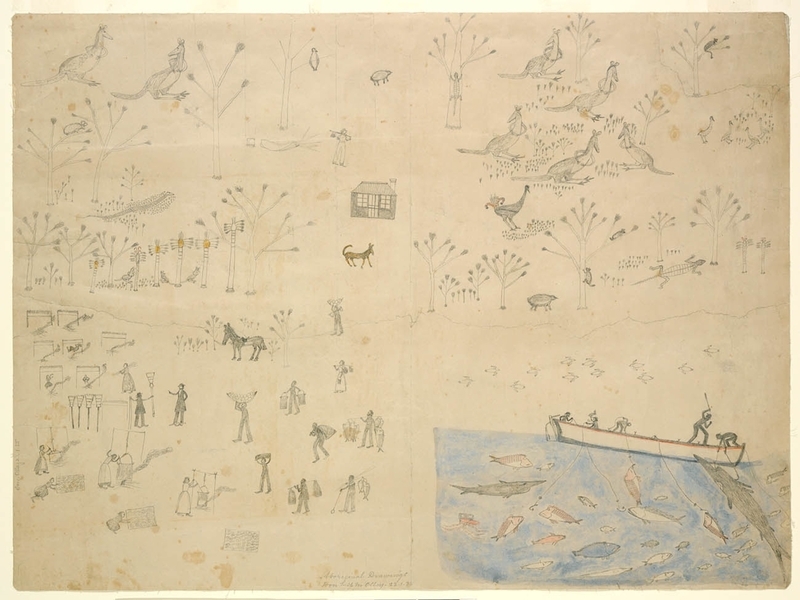 Not much is known about Mickey of Ulladulla’s early life, though the words ‘Drawn by “Mickie” an old crippled blackfellow of Nelligen, Clyde River, NSW 1875‘ inscribed some of his pencil drawings in the State Library of NSW provide a few clues. We know that from the 1840s Aboriginal men from Ulladulla were employed by settlers to fell and mill cedar, as well as in fencing, fishing and farming. We know Mickey had a patron, Mary Ann Gambell, the wife of the Ulladulla lighthouse keeper, who lived close to the Aboriginal Reserve at Ulladulla who was kindly to Indigenous people. And we know his language group was Dhurga. We also know that five paintings by “Mickey” were exhibited at the Chicago Exposition in 1893 by the Board for the Protection of Aborigines and two local officials. Ironically, one of those officials George Ilett of Milton, was awarded a bronze medal for exhibiting two of Mickey’s works as valuable specimens of ‘primitive art, uninfluenced by the white man’. Such were the times. Mickey’s work provides important documentation, social commentary and insight into the way Indigenous culture survived ... despite exile and banishment. But a whole lot more can be gleaned from the work itself. Using pencil, watercolour and crayons Mickey sketches various ceremonies, equipping and decorating his dancers carefully. Body paint, feathers and weapons are picked out with colour, leading the eye through the story. He rigs his fishing vessels accurately, and cheerfully depicts the Peterborough steamer – a supply ship for the settlement– down to its very blue hull and matching stream of smoke. What’s unique about Mickey’s work is that it provides important documentation, social commentary and insight into the way Indigenous culture survived and was, and still is, transmitted despite exile and banishment. He draws his people; he describes and details corroborees and ceremonies. And he depicts himself – an old man dressed in European clothing, caught in a rapidly changing world –propped on tall crutches, always present, watching, seeing and remembering. Editor’s note: Mickey of Ulladulla’s work is held in various collections including The National Gallery of Australia, the National Library of Australia and the State Library of NSW where good digital versions of his works can be found online.